This model is an update to the $899 M.ZUIKO DIGITAL ED 75-300mm F4.8-6.7, and although most of the differences are cosmetic, the new lens features the firm’s ZERO (Zuiko Extra-low Reflection Optical) lens coating to reduce flare and ghosting while also resisting scratches. As with its predecessor, this model also has one Super ED glass element and two ED elements out of a total of 18 arranged in 13 groups and it has the firm’s MSC AF technology for fast quiet AF. Minimum focus is just 0.9m (35.43inces). Like other Olympus MFT lenses this one isn’t image stabilized, relying instead on the stabilized sensor found on the PEN and OMD bodies. While this is off-putting for Panasonic camera users, which rely on in-lens stabilization, it means the Olympus versions are often more affordable. While that wasn’t the case with model before, Olympus has reduced the price of this iteration to a much more accessible and competitive $549. 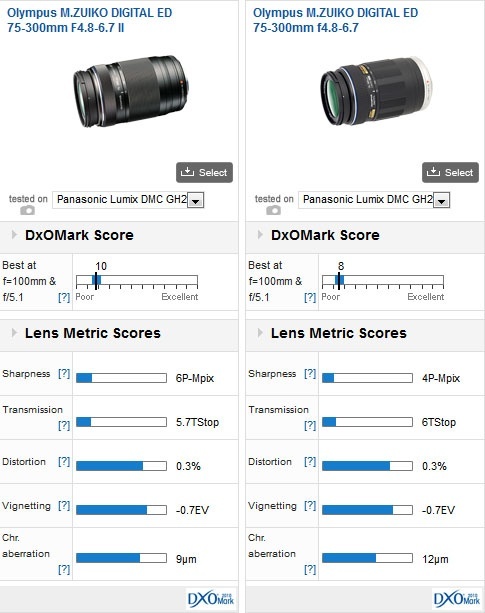 Mounted on an 18-Mpix Panasonic Lumix DMC-GH-2 the updated lens achieves a DxOMark Lens Score of 10 points and ranks as one of the best performing micro 4:3 mount telephoto-zoom lenses in our database. 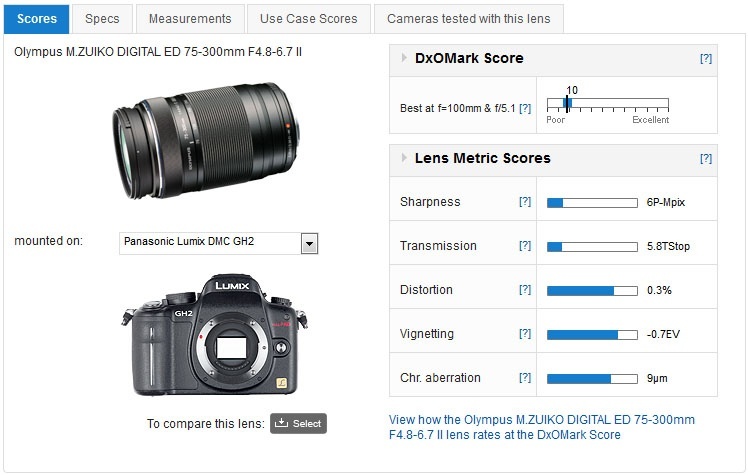 However, that and the Sharpness score are on the low side, the latter especially given the pixel count of the GH-2. Peak performance is at 100mm at f/5.1(wide-open). Unusually, in a lens like this, distortion is very low and is unlikely to be noticed at any focal length. Vignetting is also suitably low, though that is expected in a lens with a slow-variable aperture. Control of chromatic aberration is generally good, but it could be noticeable in certain (high-contrast) images at 100mm and 150mm. Compared with the lens it replaces, the addition of the firm’s ZERO lens coating appears to have improved the performance in several key areas. 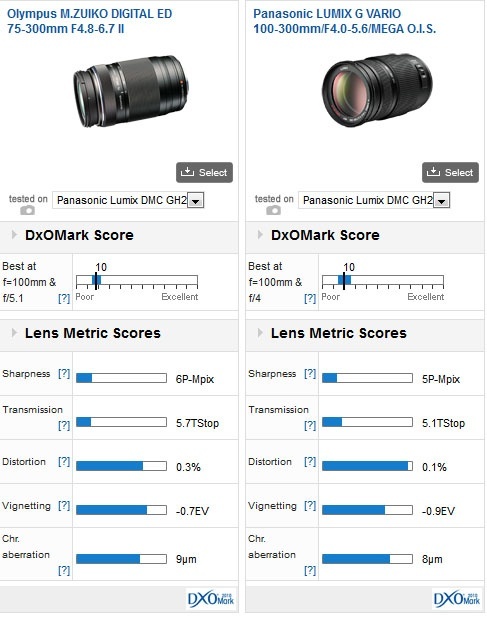 Not only is the DxOMark Score now at 10 points, versus eight for the older version, for many photographers the increase in sharpness from 4P-Mpix to 6P-Mpix is more significant. Not only that, but the new lens is brighter and has lower levels of chromatic aberration. Olympus M.ZUIKO DIGITAL ED 75-300mm F4.8-6.7 II vs Panasonic LUMIX G VARIO 100-300mm/F4.0-5.6/MEGA O.I.S. Compared with Panasonic’s $599 stabilized Lumix G Vario 100-300mm f/4.0-5.6 the updated M.Zuiko is sharper over a wider range of focal lengths and apertures, and has comparable levels of vignetting and chromatic aberration. Distortion is a little heavier but still low and unlikely to be a concern. The biggest drawback is lens speed; it’s over ½ stop slower, which can also adversely affect contrast detection AF systems, as well force the user to increase sensor sensitivity. 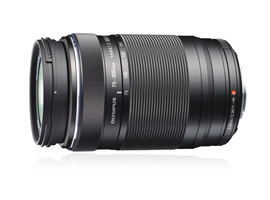 Without doubt, compared to the Panasonic rival this lens model’s predecessor was awry on price. The newly updated model brings with it not only a more up to date aesthetic but also tangible improvements in image quality. Add to that the new lower sticker price, and it’s quite clear that if deciding between the last of old version on retailer’s shelves and this one, then the updated model is the one to choose.